I realize that given some of the somewhat complex recipes and step-by-step tutorials I have in the archives one might incorrectly assume that something simple like a vanilla panna cotta would not excite me. The best dishes, however, are often the simplest. The panna cotta, an Italian dessert as traditional as the tiramisu, epitomizes this idea. I am astonished that a dessert made from so few ingredients, simply stirred together and gently heated to a simmer, could be so wonderful. A few weeks ago I decided to purchase vanilla beans to showcase them in a dessert for you guys. If you have ever bought vanilla beans before, you probably are aware of how expensive they can be. In Toronto, two or three beans can cost upwards of eight dollars. Do they cost the same where you are? The flavour from a vanilla bean, and the ‘vanilla caviar’ (yup, that’s really what the vanilla marketing people call it) plucked from inside it, is so much more intricate though than the weak, one-note taste from a stained plastic bottle of vanilla extract. I used to think that the cost was worth it. Buying vanilla beans online is oh so much cheaper. The cost difference is ridiculous, really. I bought vanilla beans online for a bit more than a quarter per bean. I have so many vanilla beans now that I do not even know what to do with them. I considered handing them out as gifts to my friends, but strangely teenagers are not particularly excited about receiving wrinkled vanilla beans. What is our world coming to? I also thought about making another batch of this, this, and this, but realized that the vanilla flavour would shine much brighter in a light, classic dessert like a panna cotta. Panna cotta is definitely one of the easiest and most elegant desserts to make (second only, perhaps, to a bucket of Cool Whip gracefully plopped on a dessert plate and served with a mug of fizzy grape juice). All you have to do is mix together cream, sugar, and vanilla and then bring the mixture to a simmer. Then add a few spoonfuls of gelatin dissolved in water and you are pretty much done. Almost. If you use vanilla extract, then all that is left to do is to pour the mixture into ramekins or glasses and stick them in the fridge overnight to allow the gelatin to set. If you really want the vanilla flavour to shine through, and so you decide to use a vanilla bean instead, then you will have to cool the mixture over an ice bath first. While the extra step may seem strange and even perhaps at first unnecessary, it is an essential one to guarantee a spectacular presentation. Vanilla caviar is denser than cream, and so simply pouring the panna cotta mixture into ramekins would result in all the dots of vanilla settling to the bottom. While this will not have a drastic influence on taste (the majority of the flavour from a vanilla bean is actually from the oils of the bean diffusing into cream and not the pretty black specks of vanilla caviar), it will make your dessert look it had a generous sprinkling of poppy seeds. In other words, wrong. On the other hand, stirring the mixture over an ice bath makes the gelatin begin to set and the panna cotta mixture thicken. Eventually the mixture is thick enough that those specks of vanilla are unable to sink down to creamy depths. Only then should you pour the lightly sweetened goodness into ramekins or glasses. Of course, if you use vanilla extract, stirring until thoroughly chilled is completely unnecessary since there are no specks of vanilla in the first place, but instead just slightly disappointing vanilla notes throughout. While a silky vanilla panna cotta is wonderful by itself, a fruity backdrop can provide the acidity necessary to really balance out the flavours of the dessert. 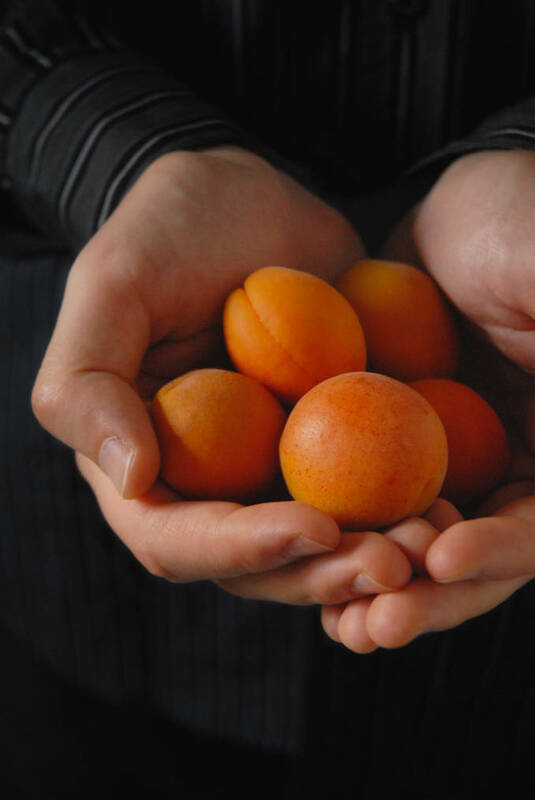 I chose to use these delightful Ontario apricots. A really neat way to prepare stone fruit is by poaching it. I poached the apricots in vanilla and amaretto poaching liquid (pretty much just sugar-water with some added spices) until tender, which was only about five minutes. The apricots really pulled everything together, especially after I sprinkled them with some chopped up pistachios to provide a crunchy element to this simple, impressive, and overall delightful dessert. 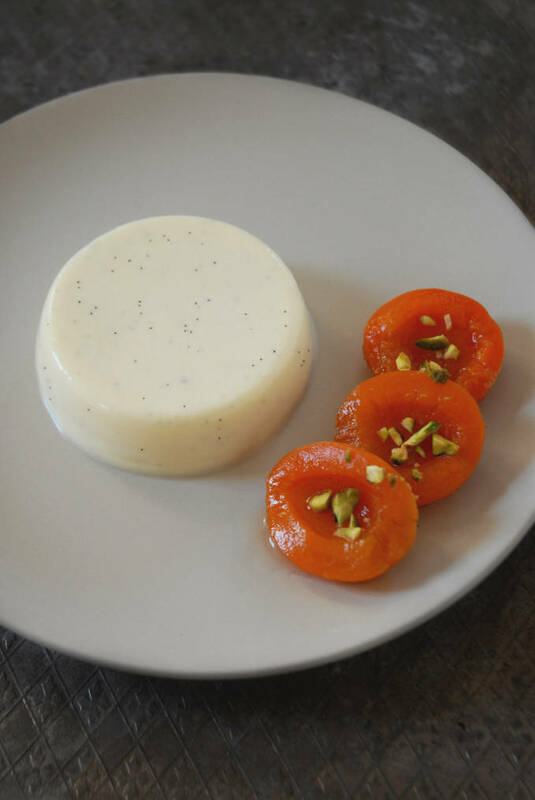 Vanilla panna cotta with amaretto-vanilla poached apricots and chopped pistachios. Mix together the cream and the sugar in a saucepan. Score the vanilla bean with a knife and remove the vanilla caviar with spine of the knife (the blunt end of the blade) by running it along the vanilla bean. Add the vanilla caviar and the bean to the cream. If you are using vanilla extract, add it instead. If you are using the vanilla bean then bring the mixture to a simmer, remove from the heat, cover tightly, and let sit for thirty minutes to allow the vanilla flavours to infuse. If you are using vanilla extract this step is not necessary. Remove the vanilla bean (and save it for the apricots) and bring the mixture to a simmer (regardless of whether you are using a vanilla bean or extract). Meanwhile, stir the gelatin into the water. Once the cream begins to simmer, remove it from the heat and stir in the gelatin until it is completely dissolved. If you used vanilla extract, pour the mixture into ramekins (or glasses if you prefer), and set in the fridge to chill overnight. If you used a vanilla bean, then pour the mixture into a large container and place it over an ice bath. Stir the mixture every few minutes until it thickens and you see that the specks of vanilla no longer sink to the bottom (this took me about thirty minutes). Pour into ramekins (or glasses) and chill overnight in the fridge to set. Bring everything except the apricots to a simmer. Add the apricots. Cover and simmer until tender, about five minutes. Remove the apricots to a container with a slotted spoon and heat the poaching liquid for a few minutes to reduce it slightly. Pour over the apricots and chill completely. Place the ramekin in a bowl of hot water so that the hot water surrounds the sides of the ramekin. This well melt the outer layer of the panna cotta. After about a dozen seconds, remove the ramekin and place a plate on top. Flip the plate and ramekin over so that the panna cotta falls out of the ramekin and onto the plate. Place a few apricot halves on the plate, pour a few spoonfuls of the poaching liquid on top of them (this is optional, I chose not to because it gave a nicer presentation), and sprinkle with chopped pistachios, if using. 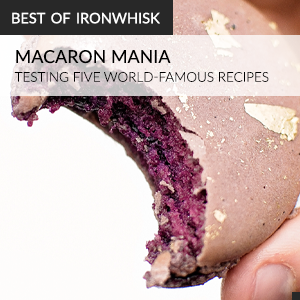 Pistachio Macarons & "Macaron Myths"
This dish looks gorgeous! So simple but so perfect! I love amaretto, those apricots sound delicious! Your panna cotta looks FABULOUS! I can never think of anything to do with the vanilla beans I have, I need to look up some recipes! I would like to formally disagree with your claim that “teenagers are not particularly excited about receiving wrinkled vanilla beans.” If one was to give me vanilla beans, I would consider it a great gift. Coincidentally, I have, in the past, become overjoyed when gifted with flour. I love panna cotta, and combining it with apricots sounds like such a perfect Summer dessert: light, cool, and refreshing! Vanilla beans are very expensive here, too. At least $8-10 for two! This dessert is so sophisticated and lovely. It looks really delicious, too!